Internet: Land of the Free? HomeBusinessInternet: Land of the Free? Cell phones, computers, laptops, tablets and portable media players have freed Americans to access the Internet wherever they are and at whatever time of day. World markets are now updated every minute, news feeds change by the second, and the free flow of business communication never stops. While the U.S. and freedom seem to go hand-in-hand, it may surprise you that the U.S. actually ranks second behind Estonia in Internet independence, according to an extensive study by Freedom House. 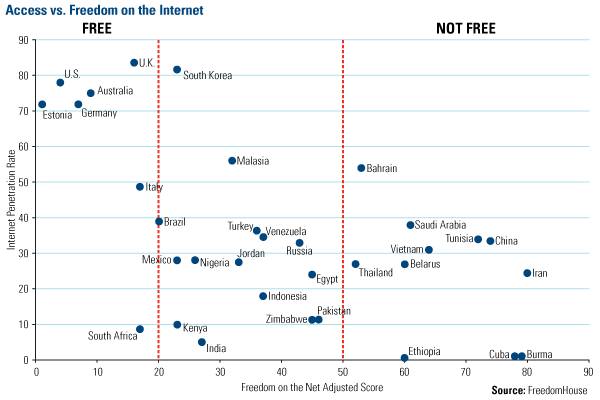 Their new report, Freedom on the Net 2011, charts different countries’ Internet activity against accessibility, revealing some rather important clusters. On one extreme, the U.S., U.K. and Australia have more than 70 percent of their population on the Internet and they enjoy almost total freedom—no surprise there. On the other extreme are Ethiopia, Cuba and Burma, where very few people access a heavily guarded Web. As I’ve discussed previously, China has an increasing amount of people on the Internet, yet there are severe controls in place to limit where they go and what they discuss. Mexico has approximately the same Internet penetration rate, yet a majority of the population is rural and lacks affordable access to the Web. Unlike China, the Internet in Mexico is mostly free of censorship: access to Facebook, Twitter, YouTube and blog-hosting services is available. What’s interesting is the cluster of countries in the middle of the chart. From this group, Freedom House has identified five critical countries—Jordan, Russia, Thailand, Venezuela and Zimbabwe – where the Internet is both “vitally important and in significant danger of repression” over the next two years. Jordan, while it has boasted that it allows more freedom on the Web than other Middle Eastern countries, has strictly monitored Internet activity among citizens. There have even been incidents of popular news websites being hacked after posting sensitive material. And, as Venezuela prepares for a presidential election in 2012, restrictions to websites and blogs as well as censorship are expected to increase. In Egypt, the Internet played a huge role in forcing Hosni Mubarak to resign because it allowed its citizens to organize protests in the streets. By the time the government stepped in to block Twitter and Facebook, two very important social tools to mobilize protesters, they were too late. In the online world, the rate of change has been accelerated, and the countries in the middle section of this chart represent a tipping point. The number of people accessing the Internet will most likely grow, forcing countries to act. They can encourage the free expression we enjoy in America or create greater repression and begin a chain reaction that affects personal Internet users, businesses trying to compete worldwide and politicians trying to effect change.